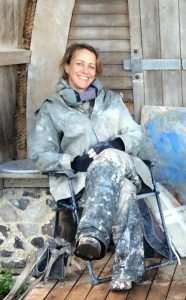 Sophie Levi works in oils and pastel in her studio in Camden Town, and in-situ in the landscape in London and at the coast. She exhibits widely including in The BP Portrait Award, The Royal Academy Summer Exhibition, The Royal Society of Portrait Painters,The Hunting Art Prize exhibition, The Discerning Eye and The Lynn Painter-Stainers’ Prize Exhibition, The New English Art Club and at Thompson’s Gallery in Marylebone. In 2012 one of Levi’s portrait paintings was shortlisted for the biggest art prize for a single work of art in the UK, the £30,000 Threadneedle Art Prize. In 2015 Levi competed in the Sky Arts Landscape Painter of The Year competition. In 2015 Andrew Marr sat for a portrait by Sophie. He called her a proper artist! Levi’s growing reputation and collectorship has resulted in her works entering distinguished collections such as John & Frances Sorrell, Christopher Forbes, New York, King’s College, Cambridge and HRH Prince of Wales. Open Weds, Thurs, Friday, Sunday, 12-5pm (closed Saturdays).